Ah, well, at least I have a lovely, fun picture book (not mine :)) to share with you today! Links To Resources: Kids Activity Guide with printable growth chart; Classroom Guide for K-1st with Common Core Standards; start a discussion on the difficulty and/or desirability of establishing standards; read with Duck! Rabbit! by Amy Krouse Rosenthal – how are these books alike? how are they different? Why I Like This Book: This book is short and simple, yet it manages to convey an important message with humor. I dare you not to laugh at the end 🙂 In 91 words, it manages to get across the idea that we can be big and small at the same time, and in spite of our perceived differences we have much in common. The art is appealing, and the characters’ expressions speak volumes. 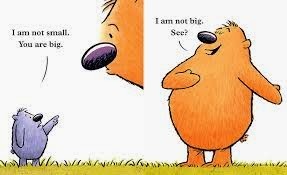 For anyone who has ever felt too little (or too big), this is the perfect story. PPBF bloggers please be sure to leave your post-specific link in the list below so we can all come visit you! Can’t wait to see what other wonderful picture books will be on the list this week! Would You Read It Wednesday #147 – Eat At Antonio’s (PB) PLUS The September Pitch Pick! How fun … that you're writing a picture book … and to discover this adorable (little) nugget on your page this morning! Thank you for another awesome lead. how cute – it sounds like a wonderful way to show how perceptions differ depending on who you are. At our house: this is too spicy! No it's not – pass the hot sauce. Keep at it, your kernel that is. I was on an 8th draft of one this week, and still playing with that kernel. I love the sound of this one, I can picture it and the language is so kid like! What a clever “little” book!! With a “big” message! Thanks! Ahhhh, it's all about perspective. So cute. Oh, and I have a PB I started two years ago and rewrote twice this week. Still … not …. working. Right there with you, Susanna! First the work of writing, then the work of publishing. Susan and I just finally got a proof back on Edmund Picke Chin yesterday. And it was full of errors. Now to wait for the next one. Keep up the good work, Susanna. 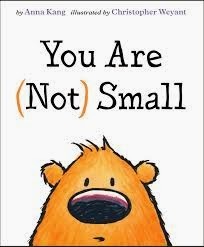 I love “You are not small” I Love how two ideas can be said in such few words. It shows the illos are just right. I'll buy this book too. Geez, this is the third book today that is a must-have for me. It sounds adorable. I've done that before more than once, Suz. But if you feel in your gut there's a story in there. Look at it again. Read it aloud. Send it to me. I might be able to see what you cannot. Sounds like a good 'un. I wonder about the good ideas that seem to avoid revelation too! As usual, it's me, not the idea though! But we keep hacking away, don't we. Here's to a better week for you, and a relaxing one for me visiting my parents. Cheers! Oh, I'm like Robyn… I can tell just from your selection that I need to keep my library account open while I read through this list. Good choices this week! I think all of us writers have that problem at least once a week: what seemed like a brilliant idea totally fizzles by the time we put “the end” on the first draft. Sometimes, it takes editors and agents to dissuade us of the notion, which is even less fun. What a cute, cute book! I'll look for it too. Thanks for telling me about this. I hadn't heard of it but will check it out. I read this one last week; it is super! It's also one of those books that makes you say “why didn't I think of that”. Oh dear. I do know about those doldrums. Time to get out the 150 hp engine and make for the closest continent. Maybe you'll find some tropical island on the way, and it will all come to you as you sit, drinking mai tais under a palm tree on a white sand beach. re: You Are (Not) Small Awwwwwwww. very cute! 91words? 'Gotta look for this over the weekend. How cute! Yup. This IS a cute one to share. Bummer about the idea in your head torturing you on paper. Been there. Done that. Didn't like it. Tomorrow is another day. Happily so true, Genevieve! 🙂 Have a lovely weekend! I know, Laura! And didn't you LOVE the end? It got a genuine laugh out of me and I didn't see it coming! Ah, then you have read it, Erik! It IS a great line, isn't it? It made me laugh! Maybe the stories we have that aren't working are all about perspective too, Kirsten 🙂 Maybe we have to look at them from a different one! You're welcome, Barb! I hope you get a chance to read it – it's cute! So happy to add this book to my list of 'why didn't I write that' books. 🙂 🙂 🙂 I didn't think I'd get a book reviewed for this week…but then realized that no one seems to have done Julie Hedlund's new one…the perfect bedtime/anytime I need to tell you I love you book. Love the cover! And I can't wait to read the ending and see what I'm dared not to laugh at! I don't HAVE Julie's book yet! Still awaiting its arrival! SO I'm glad you're doing it. Sorry to hear about your nonfic PB – frustrating! – but you're right – at least you hadn't subbed it. Good luck with it, Vivian! My library has it! And I put it on hold 🙂 Thanks! Soooo cute! You're hairy! Sooo funny!